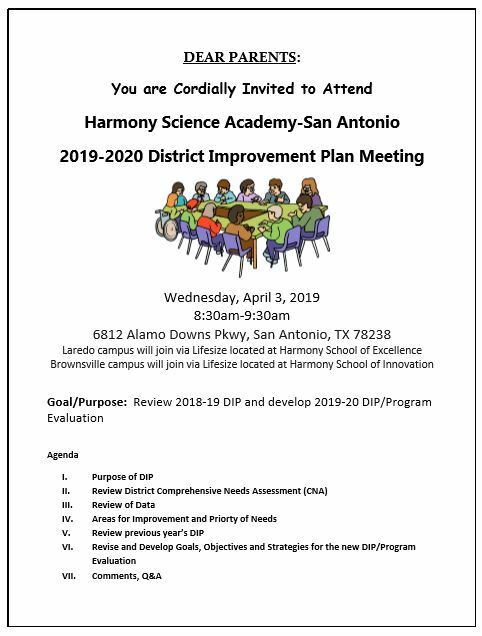 HSE Parents: You are invited to attend the Harmony Science Academy-San Antonio 2019-2020 District Improvement Plan Meeting on Wednesday, April 3rd from 8:30am-9:30am at our Cluster Office – 6812 Alamo Downs Parkway, San Antonio, TX 78238. Please see the flyers for more information. See you then!